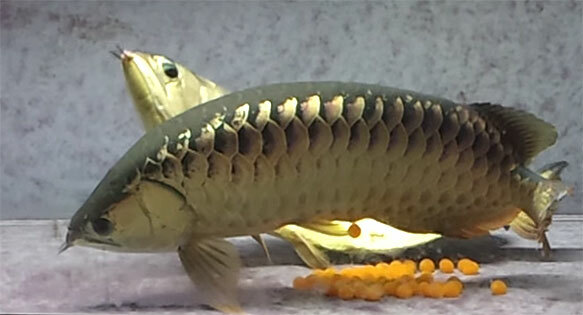 Captive spawning of Asian Arowana in an Aquarium – Screen Capture from SuperKimdaehee. One of our latest video selections is something I never even thought to look for; the spawning of Arowanas / Arawanas in captivity, but more specifically, in an aquarium. These days, captive-bred Arowanna are available and perhaps even commonplace, but that wasn’t the case when I worked in the retail aquarium trade in the early 1990s. I still remember getting in fish like Black Arowana fry, Osteoglossum ferreirai, presumably stripped from their wild fathers, their large bright yellow yolk sacks still dangling from their bellies. Now, I need only look at the in-stock of a regional wholesaler to see tank-raised (captive-bred) Silver Arowana, Osteoglossum bicirrhosum, readily available in small and medium sizes at very affordable prices. I should mention that the Asian Arowana remains strictly off-limits to hobbyists in the US, which is disappointing given the advances in cultivation and even the availability of microchipped animals. Our fellow hobbyists in the UK and Canada however, do get to enjoy these enigmatic species, with the proper microchipping and documentation of course. I’ll close with an example of the microchipping process…images at the UK link suggest this can be done to fish much smaller than the ones shown in the video below!